For over 50 years, Loctite has provided customers with advanced adhesive and sealing solutions. Our ongoing commitment to innovation insures continued development of breakthrough formulations and frustration-free dispensing systems. With over 5,000 patents, Loctite leads the category and offers the broadest line of premium quality acrylics, anaerobics, cyanoacrylates, epoxies, aerosols, silicones and urethanes. Our product portfolio features the product depth to address specific situations and the breadth to address most every bonding and sealing application. Our commitment to consumer research identifies and develops solutions that meet the needs of today's professionals and consumers: specially-engineered products, frustration-free applicators, consumer insight driven packaging and exceptional customer support. 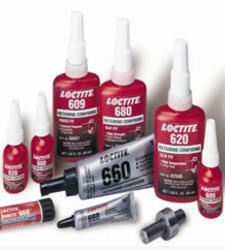 Loctite is the only consumer brand that offers a full range of high performance adhesives. Our uncompromising level of quality and innovation is achieved through a strong commitment to research and development. Loctite employs over 230 individuals in research and development with nearly 100 chemists and engineers holding PhDs. Additionally, we commit 6% of our total revenue to this initiative. This commitment to innovation, quality and reliability has truly earned Loctite the reputation of delivering "Trusted Performance. Proven Results. We are a professionally managed growing manufacturing and trading aompany, head office based in Kolkata. Though incorporated in the year 2006, we have business and managerial experience of more than 30 years and in a very short period establishment ourselves as an innovative young company with branch offices in major cities like Bangalore, chennai, Hyderabad & Mumbai.We have diverse business activities with strong presence in South and east India with more than 600 retail outlets, cutting across various trade and business activities. We are a professionally managed growing manufacturing and trading aompany, head office based in Kolkata. Though incorporated in the year 2006, we have business and managerial experience of more than 30 years and in a very short period establishment ourselves as an innovative young company with branch offices in major cities like Bangalore, chennai, Hyderabad & Mumbai.We have diverse business activities with strong presence in South and east India with more than 600 retail outlets, cutting across various trade and business activities.We are a professionally managed growing manufacturing and trading aompany, head office based in Kolkata.